Sulfur8 Glovers Dandruff Control Medicine relieves itching and scaling of the scalp associated with dandruff. For the hair and scalp. 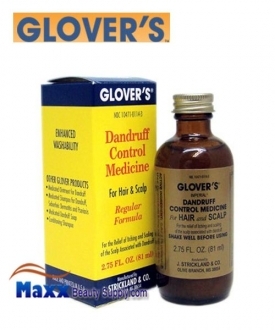 Sulfur8 Glovers Dandruff Control Medicine is for the relief of the itching and scaling associated with dandruff. Enhanced wash ability. Controls scalp itching and flaking due to dandruff. Shake well before using. For best results, use Sulfur8 Medicated Dandruff Control Medicine at least twice a week, or as directed by a doctor. Before shampooing your hair, apply a small amount to the scalp in several areas. Rub in well. Wait 15 minutes to 1 hour. Shampoo thoroughly. For external use only. When using this product do not get into eyes. If contact occurs rinse eyes thoroughly with water. Stop use and consult a doctor if skin irritation develops or increases; condition worsens or does not improve after regular use. Keep out of reach of children. If swallowed, get medical help or call a poison control center at once. Active Ingredients: Sulfur (2.5%). Inactive Ingredients: Mineral Oil (Paraffum Liquidum), Polysorbate-85, Quaternium-18 Hectorite, Propylene Glycol, Benzyl Alcohol, Fragrance (Perfume).